"Geodesign is both an ancient idea and a new idea supported by new and advancing technology," said Esri president Jack Dangermond, as he welcomed more than 300 people from around the world to the 2015 Geodesign Summit in Redlands, California. "I see GIS integrating into almost anything we do." Gamers (and the parents of gamers) in the audience were intrigued by Ulf Månsson's presentation that showed how geodesign was integrated into the popular video game Minecraft. Assisted by his Sweco colleagues, Månsson used GIS tools to build the land data that would form part of the foundation for Blockholm, a replica of Stockholm, Sweden, that would be added to Minecraft. They used Esri's ArcGIS Data Interoperability, an extension for ArcGIS for Desktop, to process real spatial data, such as topography, waterways, roads, and property information, and generate it in 3D. Because the ArcGIS Data Interoperability extension now natively supports Minecraft formats, the data can also be read back. "So if you set up a project like this where you invite players to rebuild a world, you can compare (worlds) before and after and just take out the pieces that have changed and bring them back to a GIS system such as CityEngine," Månsson said. "You could go from a CityEngine model to Minecraft, have it edited there, and then bring those edits back to CityEngine." "What is a city? For me, a city is a finite boundary of land that has to be managed," said Minicozzi. "It is essentially a farm that grows a crop of buildings. There is a cash flow behind all of that. My task here is to explain that cash flow." In ArcScene viewer, an application that is part of the ArcGIS 3D Analyst extension, Minicozzi's maps showed the taxable value per acre of land as elevations. He showed a map of Travis County, Texas. The highest extrusion was located in downtown Austin, the county seat. Another map showed a high spike for alcohol sales in downtown versus the mall areas in the suburbs. He mapped other tax data for Travis County, including mixed beverage and food sales per acre. "You see downtown popping off the map," Minicozzi said. The maps starkly illustrate how buildings downtown can often generate much more property tax and city retail tax revenue than suburban strip malls. Minicozzi recalled hearing Dangermond once say, "If you put it on a map, people get it quickly." That made an impression. "We've seen this time and time again; when we make these three-dimensional models of the taxes, people get it," said Minicozzi. Later he handed out stickers to the audience with cards displaying an image. One was of Count von Count from the children's television show Sesame Street, with the catchphrase "Do the Math." 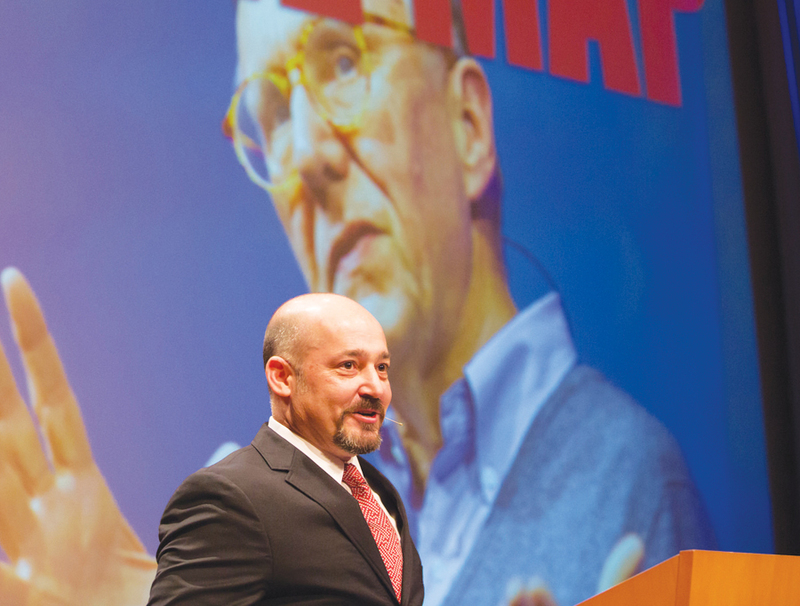 The other was Dangermond with the slogan "Do the Map." The audience chuckled, but the value of the message was obvious. 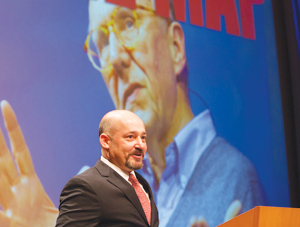 Dangermond emphasized the importance of geodesign from the standpoint of sustainability. He related that he and botanist Peter Raven had joined Paul R. Ehrlich, author of The Population Bomb, to speak to a gathering of the California Native Plants Association. "It was a thrilling conference with thousands of people who were biophiliacs interested in plants and living things," Dangermond said. Ehrlich told the audience that there was only about a 10 percent chance that in 100 years humanity would still go on. 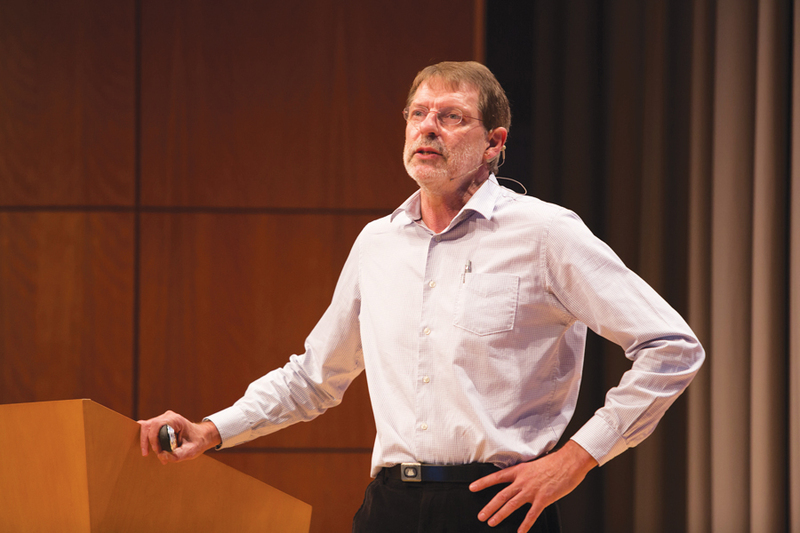 "This was very controversial to this audience," said Dangermond, adding that Raven disagreed with Ehrlich—claiming it would only be a 1 percent chance. This is where geodesign, supported by geographic science and technologies such as GIS, helps decision makers create smarter communities and a more sustainable earth. Dangermond said that attendees were here to "talk about how we create the future rather than be at the (mercy) of the future." Esri's Rob Matthews demonstrated GeoPlanner for ArcGIS. 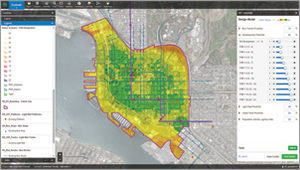 He used the app's tools to create a hypothetical Bus Rapid Transit (BRT) route through downtown San Diego, California, leveraging a geodesign approach. Next he used the tools in the app to study planning issues at multiple scales, from a city-wide BRT routing to the fine-grained placement of stations and the evaluation of land-use regulations to support Transit Oriented Development (TOD) at the site scale. 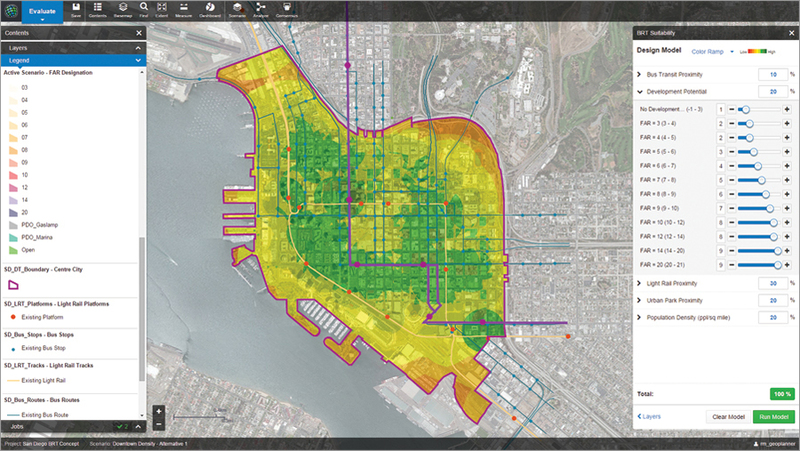 In his demo, Esri's Nathan Shephard used ArcGIS Pro to take this downtown San Diego design to a larger scale. Existing 3D buildings (courtesy of Pictometry) provided context around potential building development sites. "This is made possible with CityEngine's procedural 3D modeling. If efficiency is important to your 3D pipeline, then you are really going to like this," Patrick said. 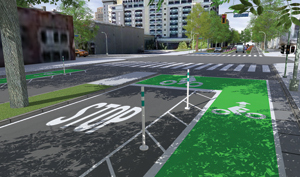 Using data from Shephard's downtown San Diego demonstration, Patrick showed the audience Complete Streets, a procedural street example that incorporates knowledge and ideas from transportation planning guidelines and standards. He used it to generate a default street, then added 2.5-meter-wide bike lanes with 1.2 meter buffers for each lane and planters, curbs, and trees. 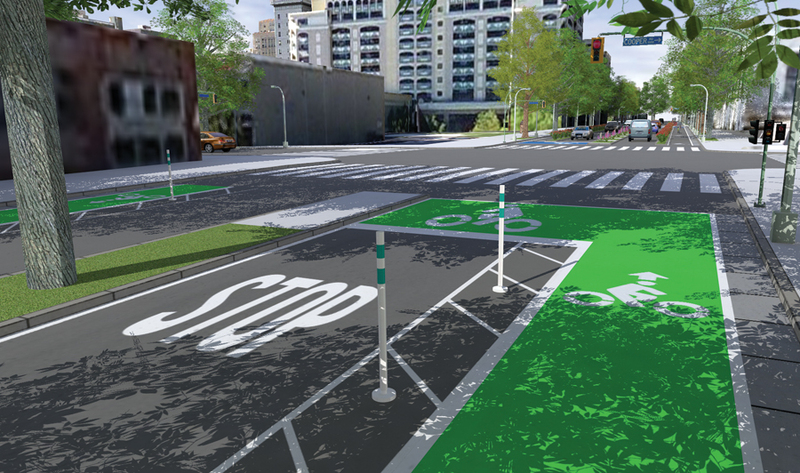 Not only can Complete Streets be used to visualize the bike lanes, curbs, and trees in 3D, it can also generate analytical reports on various aspects of the street's geometry, which is useful in coming up with rough cost estimates for construction work. Make plans early for next year's Geodesign Summit, which will be held in January 27–28, 2016. Workshops and educational meetings will be held January 25–26. Check in regularly at geodesignsummit.com or contact geodesignsummit@esri.com. And be sure to follow happenings on Twitter at @geodesignsummit.